Podosomes are actin-rich, adhesive structures that are present at the ventral surface of cells of the monocytic myeloid lineage, stimulated endothelial cells  and cultured Src-transformed cancer cells. 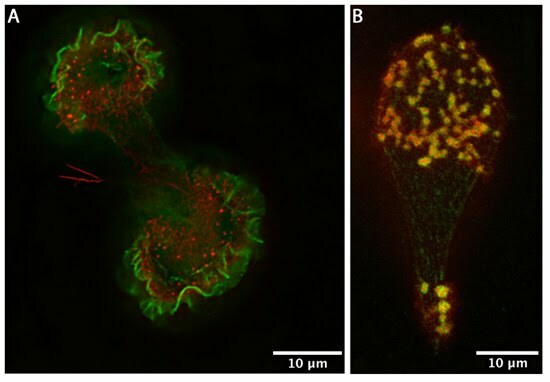 These structures are not limited to the cell periphery, but do exhibit a polarized distribution pattern in migrating cells, localizing to the front at the border between the lamellipodium and the lamellum . Podosome assembly can be described under a series of distinct steps. Podosomes are adhesive structures and so unsurprisingly they contain many of the same proteins found in focal adhesions (FAs), such as talin,vinculin, paxillin and Src family proteins . An exception to this generality is the protein Tks5 (tyrosine kinase substrate with five SH3 domains), which is found in podosomes and invadopodia, but not in FAs or any other actin-based structures. WASP (Wiskott Aldrich Syndrome protein) shows even greater specificity, being unique to podosomes. Tks5 and WASP can therefore be used as markers alongside actin, cortactin and the Arp2/3 complex to identify these unique protrusions . Structurally, the podosome is characterized by two main features – an actin core and a ring complex. The actin core contains several coordinators of actin nucleation, namely the Arp2/3 complex and WASP proximal to the plasma membrane and cortactin or HS-1 (hematopoietic lineage cell-specific protein 1) more distally . Further to the dense actin network forming the core, actin filaments emanate radially from the actin core to the plasma membrane and between individual podosomes . Podosomes have an actin-rich core region and a ring complex. Core actin binds to capping proteins whereas ring proteins bind to actin at the cell membrane. 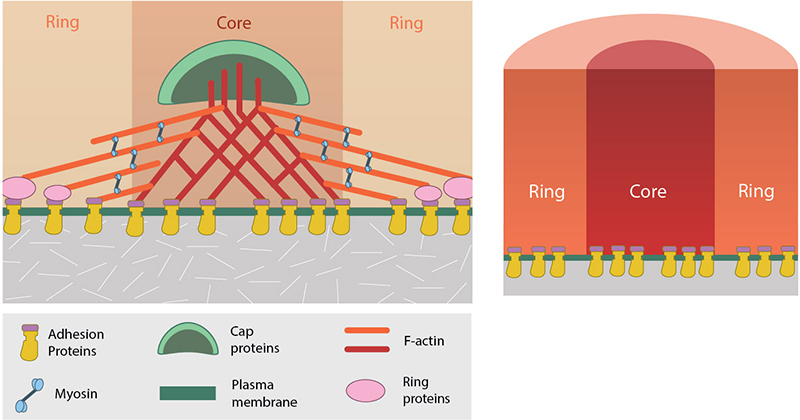 The ring complex comprises integrins and integrin-associated proteins, such as paxillin  and serves to connect cell surface integrins with the cytoskeleton. Originally thought to be a round structure, recent advances in bioimaging have shown the ring complex to have a polygonal shape . 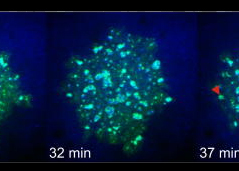 These findings were obtained by applying novel super-resolution analysis (Bayesian Blinking and Bleaching (3B) analysis) to data acquired by standard widefield microscopy of cells expressing fluorescently tagged proteins that localize to the podosome ring complex. The increased resolution of the images also suggested that different proteins within the ring complex have distinct localizations, with vinculin appearing more peripherally to talin . In general, the podosome structure is no greater than approximately 0.5 μm in width and 1 μm in depth . The lifetime of this structure is far shorter than that of focal adhesions, lasting only a few minutes .